Former 76ers baller Allen Iverson headed to the Philippines earlier this month to volunteer his b-ball skills–not as a player but debuting his coaching abilities–to American and Asian street players. Iverson’s roster consists of of Larry Williams aka “Bone Collector,” for his bone crushing skills battling against defenders and Taurian “Air up There” Fontenette , a slam-dunk champ. The “All In” charity basketball game had Iverson facing off against Philippines most winningest coaches, Tim Cole, who had NBA veteran Eddy Curry in his arsenal. Cole took the win, but the real victors are those that’ll benefit from homes built as a result of the charity game. 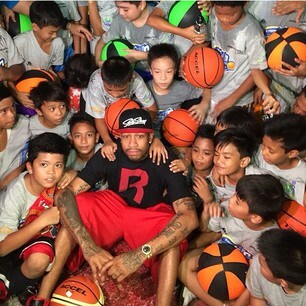 Iverson’s two-day give back visit also included a press conference and basketball clinic for Filipino kids. Iverson and Cone schooled at least 80 kids–aged 10 to 14–on how to play basketball, according to Philstar. It’s nice to see the once MVPer in the headlines for something other than his fleeting fortune.